I used this adorable stocking that I found in the Silhouette Online Store ~ 4 Christmas Icons by Lori Whitlock. I just LOVE her stuff! I cut out 3 stockings using Jillibean Soup Winter Tortellini and Spinach Soup dp. I added a die cut star and button to each. The background is embossed with the PTI Woodgrain Impression Plate, and the sentiment comes from the PTI set In The Meadow. We hope you'll play along with us this week! Just link your creations on the Color Throwdown Blog HERE, and make sure you check out the rest of the amazing DT projects while you're there! Well, I have a 5 year old in the house today. Yesterday was my youngest's birthday. We took him out to dinner last night, but we're having a Batman/gymnastic party on Saturday:) I'm trying to get some stuff made for the party so I'd better run! Thank you so much for stopping by and have a wonderful Wednesday! I love this card! Those stockings are fabulous! I love this, the colours are so soft and amazing and the LO is gorgeous! Ohhhhhh, those stockings are too cute (makes me reeeeeally wish I had a Silhoette) and I adore the papers you used. Such a great "country" feel. Your card is so cute Kerri!! I love your stockings and how you sponged them with the kraft. I also like how you took a softer approach with the colors!! Nice job!! LOVE your trio of stockings, Kerri! I haven't used my Cameo in weeks and you've reminded me I need to check out the store for more Christmas ideas! Your little stockings are sooo cute, Kerri....love the papers you used and how you added the stars and buttons!!! Thanks for the link, too...I'll have to go check out her store!!! 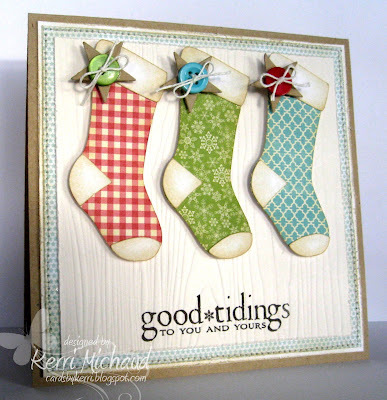 I love how you used the colors on the stockings and love the woodgrain background! The subtle sponging is just perfect! Oh I love, love, love this! The way you have these cute stockings in different patterns against the soft white embossed background really makes them pop! So sweet! The stocking trio looks great against the woodgrain background. *capital letters for extreme emphasis* KERRI, I JUST LOVE THIS!!! 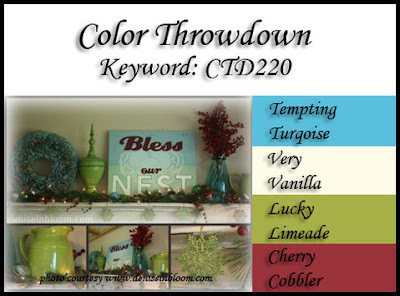 Those stockings are absolutely adorable in these colors, against the woodgrain background! JUST DARRRRRRRLING! I love this card! :) Colors are great!